John Evelyn (1620–1706), an English virtuoso and writer, was a pivotal figure in seventeenth-century intellectual life in England. He left an immensely rich literary heritage, which is of great significance for scholars interested in garden history and the histories of intellectual life and architecture. Evelyn is perhaps best known for Sylva, a compilation of thoughts on practical estate management, gardening, and philosophy, and the first book published by the Royal Society in London. As one of the group of learned men who founded the Royal Society in 1660 to promote scientific research, discussion, and publications, John Evelyn was at the center of many of the vital intellectual currents of the time. “Elysium Britannicum,” Evelyn’s unpublished manuscript of almost a thousand pages of densely packed drafts, rewrites, and projects, was perhaps something of an enigma to his contemporaries, who nevertheless urged its publication. It remains for scholars today a treasure-trove of fascinating insights on Evelyn and his milieu. 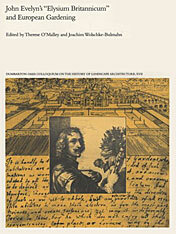 The contributors to this volume approach Evelyn and his work from diverse disciplines, including architectural and intellectual history and the histories of science, agriculture, gardens, and literature. They present a rich picture of the “Elysium Britannicum” as one of the central documents of late European humanism.